Over the past few months I’ve been working on a new constituency map for the UK in preparation for the recent General Election. I’d been considering the idea for a while as the data was available but not pulled together in a large printable wall map format. The focus for the map was always to create something not only functional but attractive too. A good map must always start with accurate data. So I chose the parliamentary boundaries available from the Office for National Statistics. This data is very detailed, so I applied a process known as cartographic generalisation to simplify and smooth the boundaries. I also felt it would be important to include some context to each constituency as many do not follow recognisable boundaries. For this reason I included a selection of towns and cities along with the Welsh & Scottish borders. The size of constituencies also varies widely between rural and urban areas. So an obvious solution was to use inset maps. These show the major urban areas of London, West Midlands and North West England in much greater detail. I chose a colour pallet with an emphasis on pastel colours for each of the parties. I also made a distinction between Labour and Labour Co-op constituencies with a subtle change in the shade of red. Good design requires good typography, so a fresh sans-serif font was ideal. The added finesse of a halo helped to lift the text and to bring the final layout together. The map was updated on the 9th of May with the election results so is fully up to date. Any future by-election results or constituency boundary changes will be included as and when they happen. Follow our twitter page @mapmarketingUK for updates on that. 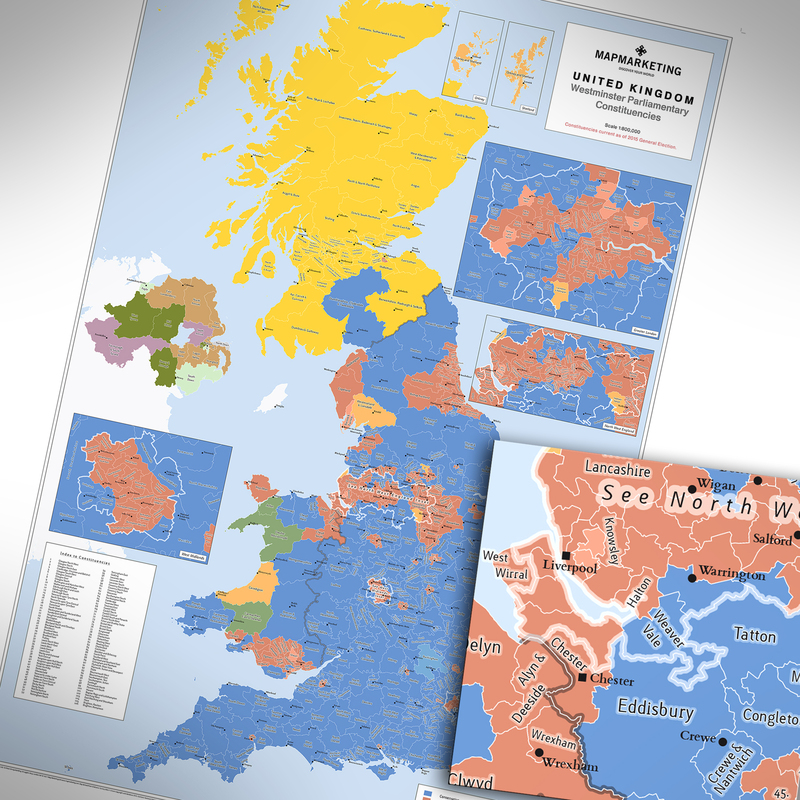 Look out for a future post on how we made our abstracted UK map showing all the elected individuals for all 650 parliamentary constituencies.